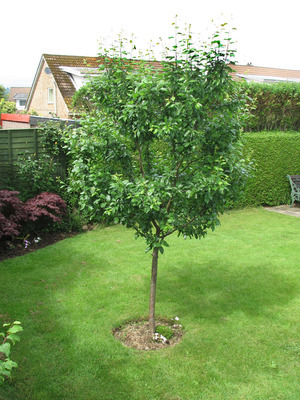 I have a 4/5 year old victoria plum tree, which hasn't yet given any fruit and will not do so this year. But instead each year it puts on a lot of growth, masses of shoots in all directions and it is already over 10' tall. I don't know what rootstock it is grafted to but the union is plainly visible. It grows in a grassed area with a bare circle cut around the trunk. Please how and when do I prune the over-crowded branches and shoots and is there a way to make the tree less vigorous and more fruitful?? I don't profess to be an expert on plum trees but can only share my own experience if its any help, I have a 20 year old Victoria Plum and very rarely has it not fruited, only if late frosts when in flower, I try to keep it about 10 ft high by cutting off the new shoots that grow vertically as and when they appear during the growing season, this has resulted in a tree that is an umberella shape allowing access to fruit easily and means I am not cutting off old fruiting wood by mistake, the last two years I have had to support the branches of my tree due to the weight of the fruit they bear ! Thank Dido, I will try the same. I have some tips for you . Before and during flowering stage, water it using soluble fertilizer rich in potassium.This makes the pollen more fertile. Horizontal branches should be preferred to stay rather than vertical once. Your tree in the picture is finding itself more comfortable staying in the vegetative stage as it must have an abundant amount of nitrogen in the soil. In such situation the tree will not produce flowers with healthy pollen. Thanks for the tips Easyman, but going on what I've read on other postings concerning plum trees most say that pruning should take place during the summer months owing to the threat of silver leaf, but it's worth the risk, because a tree with no plums is no good to me. « Are eleagnus plants poisonous to horses.